Margaret is a strategic member of our team at Wealth Management Group. She is an integral part of our client services model. Her many years of experience in our industry is invaluable to insure excellent service and communication with our clients. 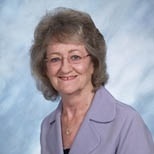 Margaret began her career in the financial services industry with Rotan Mosle/PaineWebber in1983. In 1993 she joined Lehman Brothers operations until the office closed in 1996 and rejoined PaineWebber as an assistant operations manager. In 2000, she moved to Tucson, Arizona and joined Wells Fargo Investments as a branch administrative manager. In 2004 she resigned and returned to Texas. In 2005 she joined M P Wealth Management Group LLC (Wealth Management Group) an independent financial services practice that is a branch office of LPL Financial, the largest independent broker dealer in the country (as reported in Financial Planning magazine, June 1996-2017, based on total revenues). She holds the series 7 and series 66 registrations through LPL Financial.